I think we’re all always looking for that touch that makes a design feel fresh and different – a pattern, a photo, or a texture that doesn’t feel like stock. One of my favorites sources is Flickr â€“ but probably not the way you use it. Sure, most of us know about Flickr’s vast library of creative commons licensed images but there’s another rich vein of fascinating imagery worth exploring. Many of the world’s great libraries, government agencies, private companies, national & state archives, museums, and historical societies use Flickr as a catalog for their books, documents, illustrations, and photographs. The majority of it is in the Public Domain and copyright free. Incredibly, The Internet Archive of Book Images alone has been digitizing lapsed copyright books for well over a decade now, and now has more than 5 million images on the site. The works fall into two broad categories. Works with lapsed copyright: These are old works â€“ books, magazines, posters and advertising materials â€“ where copyright and often the creator/s themselves expired long ago. Works of unknown creator/s: Often archive photos, these are works where the creator’s identity (and by extension, copyright) can no longer be established. Accessing these images isn’t hard. 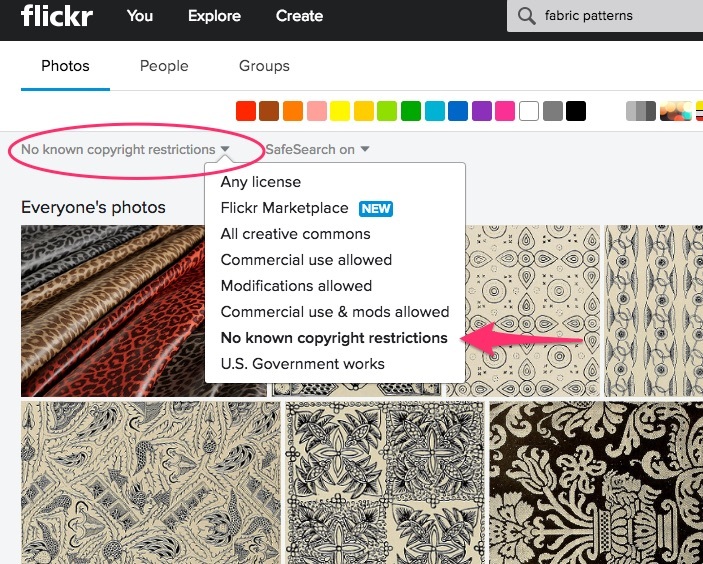 Perform a standard search, click the ‘Any license‘ dropdown on the top left and hit ‘No known copyright restrictions‘. How might you use these images? Clearly we’re not talking about the kind of neatly-targeted, predictable graphics you’d expect to find on a big stock site. This is a huge library so you’ll need to go in with a plan or you could be clicking ‘next page’ for days. Internet Archive.org has cataloged a vast library of early 20th-century interior design and fashion books containing an almost endless selection of fabric and wallpaper samples.. 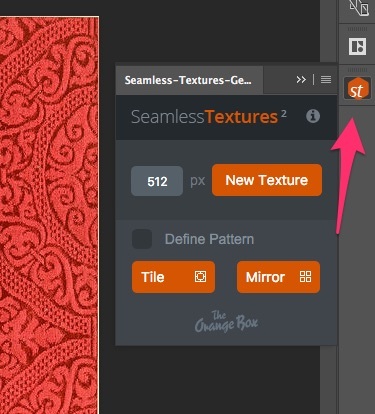 This might be a good opportunity to test-drive a Seamless Tiling tool like the free offering from The Orange Box. Illustration was relatively rare in books before 1900, but typography and text decoration have a long and… well, decorated history. If you’re looking for a design touch with a slightly mysterious, ‘Da Vinci Code’ feel, you’ll find some breathtaking examples of illuminated texts dating back to the 9th century. 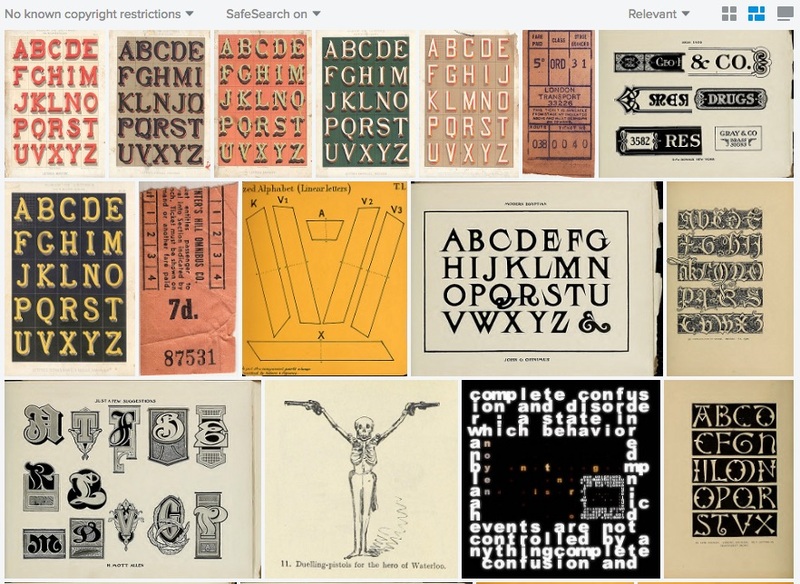 However, if you’re looking for something more modern, a simple search on ‘typography text‘ is enough to turn up pages of extraordinary and often forgotten typography. 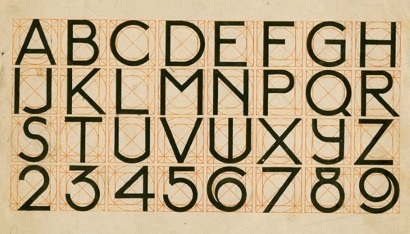 If you’re looking to evoke a mood, sources like the Library of Congress provide tens of 1,000’s of incredible shots of everyday life that can bring warmth and earthy charm to a design. Now, I have to admit, finding useful public domain imagery on Flickr takes a combination of clever ‘search-fu’ and some dogged determination. You have to get creative with your searches. The automated systems that bulk upload these images to Flickr do a decent job at tagging them meaningfully, but the sheer volume is something you’ll need to just deal with. There’s some seriously weird stuff in there too – old medical diagrams, phrenology, and strange alchemists texts. It’s an interesting tour. But I have to say â€“ there’s something nice about resurfacing work that may not have been properly looked at in many decades.